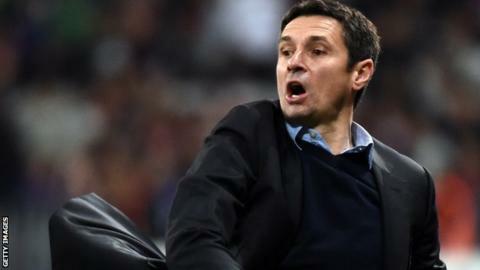 Aston Villa will appoint ex-Lyon boss Remi Garde as their new manager on Monday - replacing Tim Sherwood. The Frenchman will sign a three-and-a-half-year deal and will watch Monday's trip to Tottenham from the stands. The 49-year-old inherits a team bottom of the Premier League with just four points from 10 games. Bastia coach Reginald Ray will become Garde's assistant and the pair will take charge for the home fixture against Manchester City next Sunday. Garde guided Lyon to league finishes of fourth, third and fifth during three seasons from 2011 before leaving in 2014 for "personal and family" reasons. The former midfielder - who was Arsene Wenger's first signing at Arsenal - was capped six times by his country. After retiring from playing at the age of 33, he coached at Lyon before becoming manager in 2011. Wenger confirmed Villa's chief executive Tom Fox - a former Arsenal employee himself - had been in touch to discuss Garde's pedigree. Garde - who also played for Lyon and Strasbourg - was assistant to former Villa boss Gerard Houllier at Lyon and the pair discussed the Midlands club this week. "I told him it was a great club with excellent facilities, a very good fanbase and they have a chairman that backs you," Houllier told the Daily Telegraph. "He is not somebody who has no experience, he speaks the English language and will get his ideas and philosophy across. His philosophy will be attack-minded, he likes to build his teams from the back." Garde's only major honour as a manager arrived in 2012, when he guided Lyon to the French Cup. Sherwood was in charge for eight months and kept Villa in the Premier League last season as well as reaching the FA Cup final. But they lost key duo Fabian Delph and Christian Benteke during the summer and Villa have not won a league game since the opening day of the season. Sherwood was sacked after defeat against Swansea. It was Villa's fourth straight top-flight loss. The club invested more than £8m on Jordan Ayew, as well as £7m on Jordan Amavi and £7m on Jordan Veretout during the summer. And BBC Radio 5 live's Midlands football reporter Pat Murphy said: "Garde will be expected to get more out of the more inexperienced French speaking players. The feeling still remains though that these players actually might not be good enough. "Whichever way you look at it, whatever way Villa try to dress up Garde's pedigree and potential, it still is a major gamble by owner Randy Lerner to appoint a highly talented, promising young manager in his first job as a manager outside of France. He's really got to hit the ground running straight away."